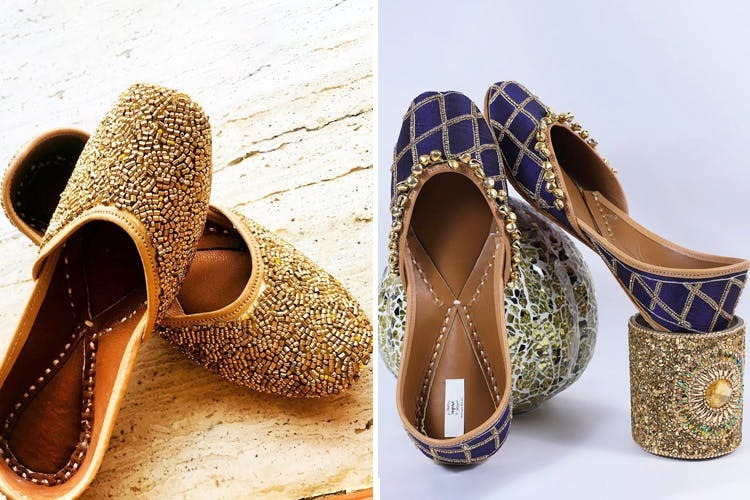 Sayurie is a homegrown footwear brand that does handcrafted leather juttis which will tie in your ethnic OOTDs perfectly during the wedding season. Nothing completes an Indian look like the perfect pair of juttis to go with it. Sayurie is a homegrown footwear brand that's got your next favourite pair in store. First things first, let's appreciate the fact that their footwear is handcrafted by skilled artisans that do some fine handwork on them. They've got a collection of leather juttis that'll go well with your ethnic outfits–be it on Diwali or your BFF's upcoming wedding. The collection has pairs like 'Jashann' that is embroidered with golden moti and zari jaal decorated with payal of golden ghungroos, or the 'Monochrome' with a grey matt base with delicate silver dabka strings and flowers and swarvoski beads, or check out 'Moonlight' which uses a knot technique of dabka to enhance the beauty of the silver base–there are many more options. They've also got a line of men's juttis but we didn't get a chance to look at them. Their website doesn't have their entire collection on it. We hope they'll start putting up more stuff on the website soon. Follow their social media handles to stay updated with the latest designs and styles.